Cederberg – August 2012, a set on Flickr. It is always an uplifting experience to walk in this magnificent part of the world. I had not been there for some time, so it was good hike some of the familiar paths and to experience some of the not so familiar routes. The weather for the weekend held to the predicted clear and warm, with some light rain coming in on Sunday evening, prior to our departure on Monday morning. There was quite a bit of snow at the higher levels and plenty of white frozen sheets, at the lower levels, showing how low down the snow had come. Camping was chilly and getting up in the morning a bit of a challenge. 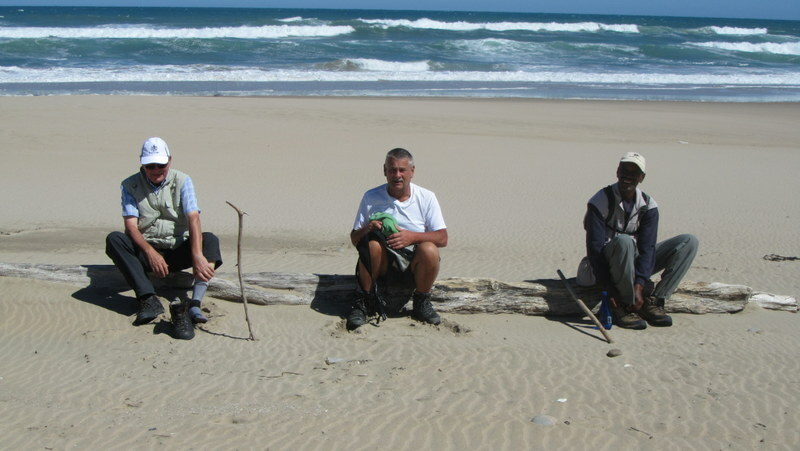 Having arrived just after midday, we decided to walk to the Maltese Cross before setting up camp for the evening. It is about a four hour round trip, allowing for a bit of time to spend at the ‘Cross’ itself. I had not been on this route for a very long time and was a bit surprised that it was quite an uphill trek – somehow I was expecting it to be flatter – but that is probably a perception created by the photographs that show it to be surrounded by a fairly level plateau. It is not surprising however, when one realizes that this plateau sits at an elevation higher of 1400m, higher than the entrance to the Wolfberg Cracks. What a brilliant hike, with the reward of the overwhelming splendour of the ‘Cross’ itself, not to mention the formations, rock layers and natural sculptors on the route. There was a welcome cold beer waiting in the cooler box on our return, while we set up the tents and got the fire going while it was still light. 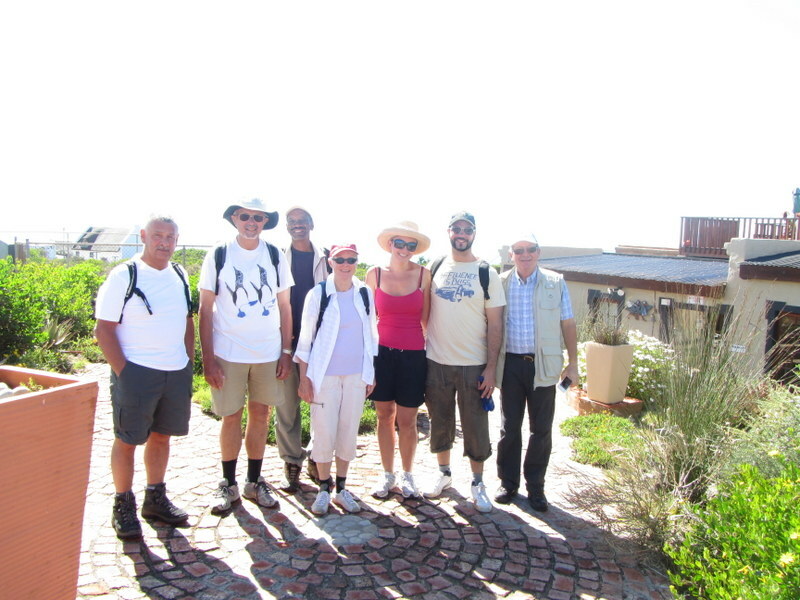 Later that evening we attended an (outdoor) talk at the Cederberg observatory. In spite of warm clothing it was a fairly chilly outing. It is great to be reminded of just how many stars there are in the sky and just how small we are in relation to it all. With no moon on the night there were so many stars that it was even difficult to spot some of the more familiar one – an awesome sight. It was up at first light the next morning to give ourselves plenty of time to get through the ‘Cracks’ and to the Arch. We were a bit slower getting going than we had planned. The main excuse was that there was no hot water in the men’s showers (pipes frozen?). After a bit of research (as there were no women in the camp) we found the hot water in the ladies ablutions – maybe because it was ‘Women’s Month’. The walk up to the Wolfberg Cracks is fairly steep, but it is a good path that is well graded. It never really feels as if you are climbing that much. I had done the route several times and it is well cairned, so it is not difficult to follow. For our own interest, we spent a bit of time exploring the ‘easy’ route to the small crack. This route avoids going under the chock stone and across the narrow ledge, but it is not that easy to follow and although we did find it in the end, it was more by luck than good judgement. As we had left our packs at the start of the usual route, we had to go back to fetch then and came through that way. The small crack has a few challenges, with scrambling over rocks and boulders and squeezing through a few narrow openings. Except for two places, none of these are any real problem, apart from the rocks being a bit rough and likely to give one the odd scrape or scratch. The first of the two challenging obstacles, is a short chimney, where it is necessary to push oneself up using feet and back, until you can get the fingers in to a small crevice to pull and manoeuvre yourself on to the boulder at the top – not easy, but doable. The second obstacle, quite close by, is a boulder that you need to slide under, with only just enough room for a medium sized person to get through. It can be a little claustrophobic, but with the right angles not too difficult. There is a way over this, that I have done in the past, but on the day looked more daunting than going under. 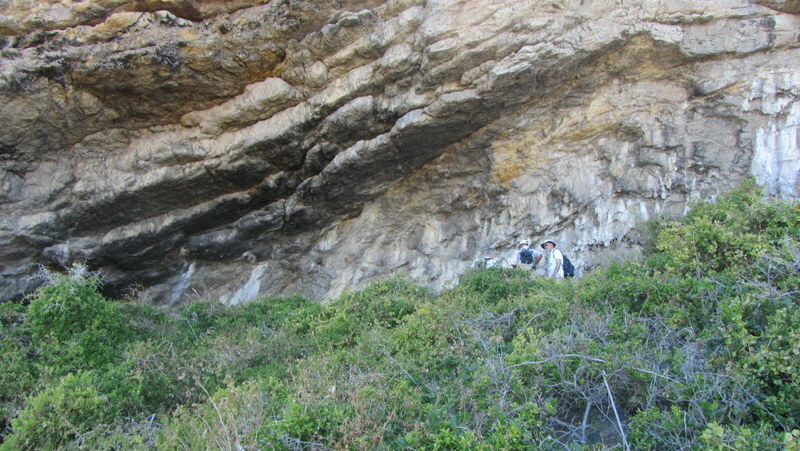 Once through this section there is a narrow crack that leads out on to the ridge above. It is a good place to rest and have a tea break. There is a large flat area of rock above the cracks with magnificent views over the valleys below and surrounding peaks. There are various cairned routes to the Wolfberg Arch from here, offering the hiker slightly different options for the out and return route. The route is over and flattish plain with a few rocky outcrops in between. On the outward route, the cairns are a little more difficult to follow than on the return, but it in clear conditions, following the general direction is no problem. From the top of the Cracks, the Arch can be seen in the distance, but only becomes visible again on the final plain. It is a walk of approximately one and half hours to reach the outcrop on which the Arch is perched, and another twenty minute to get up to the base. While from a distance, you might think it is just another of the majestic formations of the area, but once there, it is a very special and awesome spectacle. The walk back to the wider of the two cracks and the route down, is very well cairned and we did this at a faster pace than the outward trek. The wider crack is a beautiful and tranquil place, and reasonably easy until you get close to the end. The climb down to rejoin the path is quite tricky, with some rough downward scrambling and boulder to negotiate over or around. At the end of long days hike it is tiring rather than difficult. As you meet the path you can look down to the valley below and clearly see the route back to the cars, parked in the parking area below. If the beers at the end of the first day were welcome, at the end of this day they were appreciated even more. With an hour deviation for exploring, the hike had taken us eight hours. As we prepared dinner the predicted rain threatened, but held off until we had eaten, enjoyed some local red wine (Cederberg Cellars) and got ourselves into our warm tents and sleeping bags. Luck held again the next morning when the rain held off while we packed up and headed for home, after the obligatory visit to the Stadsaal Caves. A wonderful, although all too short weekend. 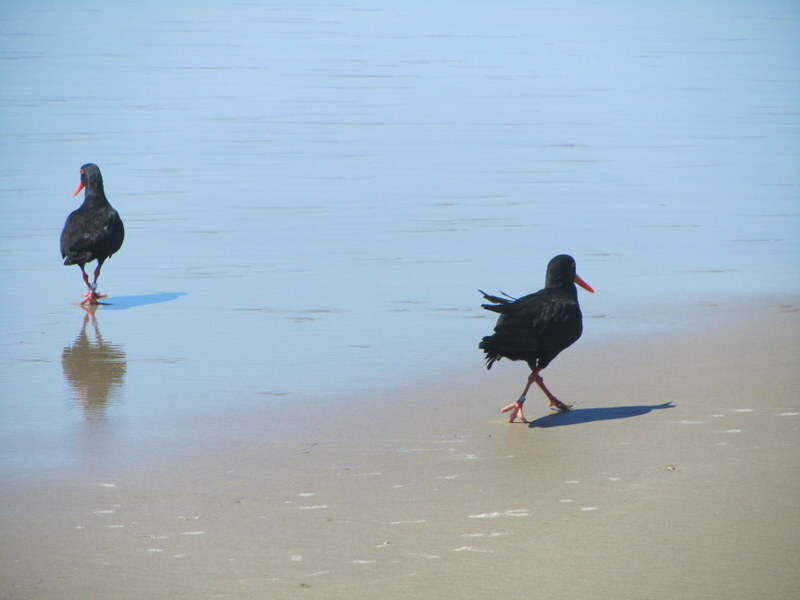 The Oyster Catcher Trail was probably the trail that first put the idea of ‘slackpacking’ on the hiking agenda.Readingabout it five or six years ago, was what first stimulated my interest in the idea of comfortable hiking. 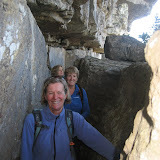 Amazingly, it has taken me this long to do it, but I was given to opportunity to join a group on the trail last Friday. 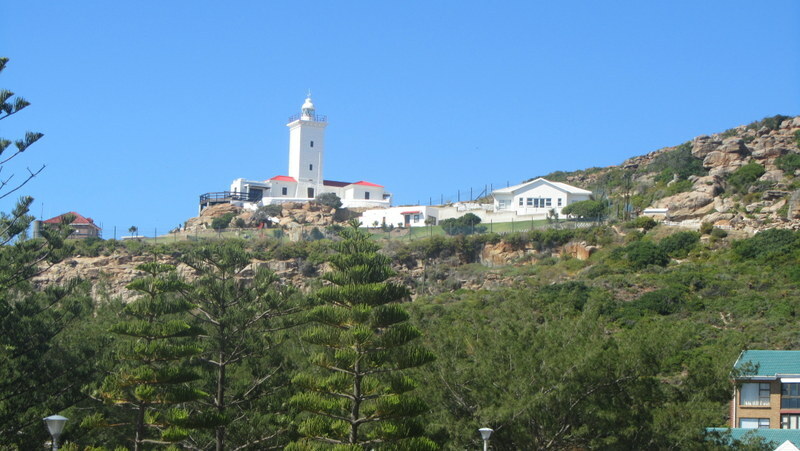 In summary it lived up to and exceeded my expectations, with the only disappointment being the environmentally disastrous Pinnacle Point Golf Estate that has scarred a section of the coast line – more about that later. On Friday evening we gathered at the impressive Ana’s Guest House in Mossel Bay, for introductions and pre-trail briefing. 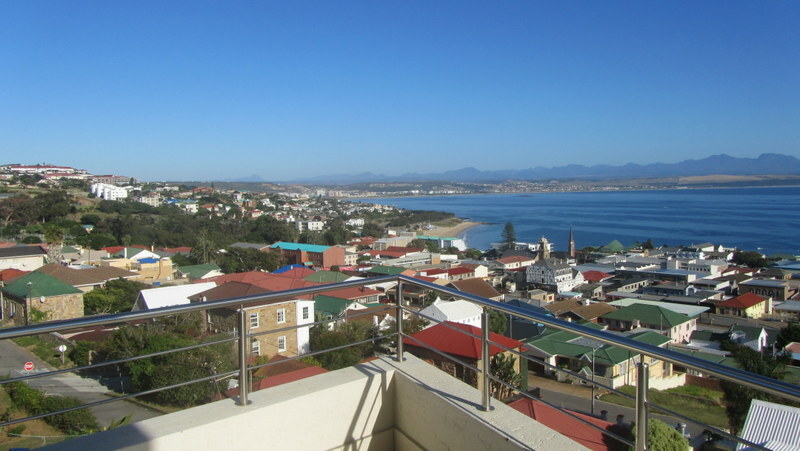 This certainly set the bench mark for accommodation, with luxury appointments and a wonderful view over Mossel Bay from the second floor balcony. Tim, John, Hans & Ursula were already there, wine glasses in hand. 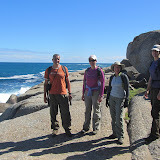 Alex and Camilla, arrived shortly afterwards; having taken the long and scenic route fromCape Town, through Hermanus. from: Tim –Ireland (& George), John –Wales, Hans & Ursula (Germany), Alex and Camilla –England & Australia and of course, myself from Cape Town. The briefing was informal and humorous and we were quickly given an overview of the programme for the next few days. Transport to dinner at the Kingfisher arrived promptly at seven. Informal, with a magnificent setting overlooking the beach, it did not take the group too long to feel as if we were old friends. The menu offered a good variety, with a leaning towards seafood (what else in this setting), but plenty for the carnivores. After a good meal and a few shared bottles of wine, most of us, having driven up from Cape Town, were ready for the luxury of our duvets. The sun streamed through my window by about 5.30, but I still managed to doze for some time after that. The gathering time was 7.45, so there was plenty of time for a slow wake up. We were all downstairs in good time to meet Willie, our guide for the next few days. 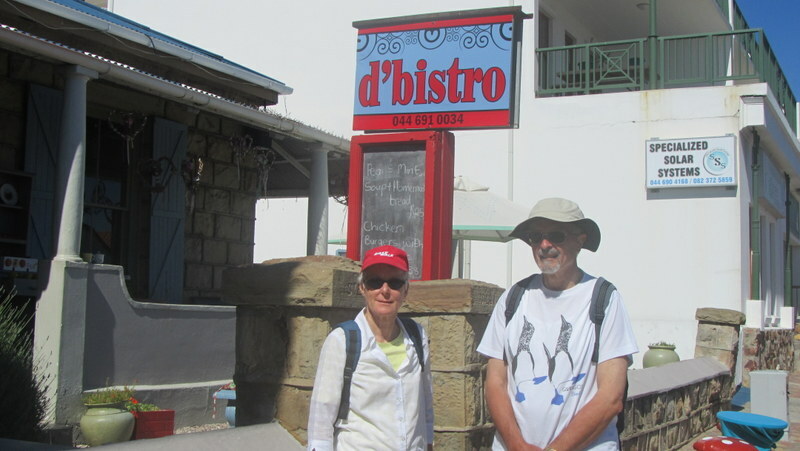 After a quick cup of tea, he gathered us together for the short walk to ‘d’bistro’, our breakfast venue. Breakfast was substantial, with selection of fruit salad, fruit juice and cereals, plus a delicious scrambled egg filled croissant with bacon and tomato – mmm. Clearly this was not going to be a trail on which we were likely to lose much weight. After breakfast, we left the Bistro to begin the proper trail. We walked through town to the Point, close to where we had dinner the previous evening. 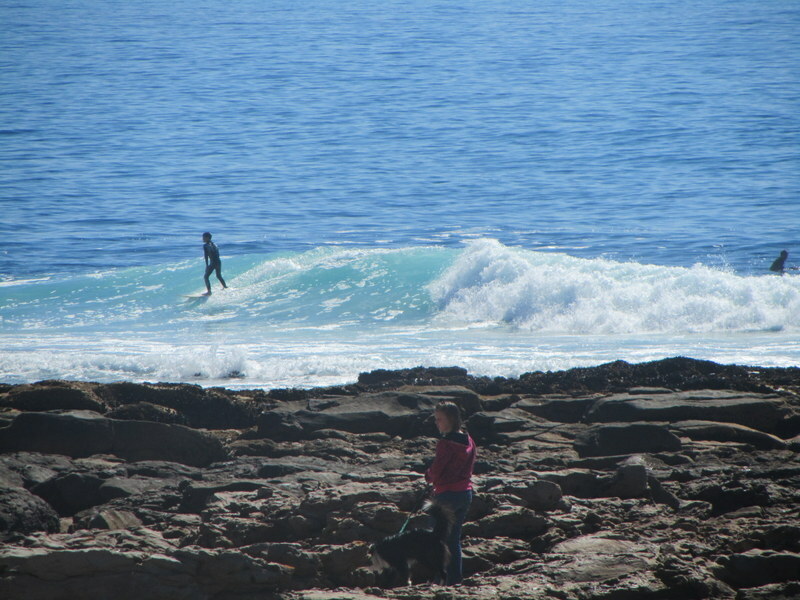 The early young surfers seemed so close you could touch them, surfing straight towards to the rocky headland, but never seeming to be in any danger of surfing onto the rocks. 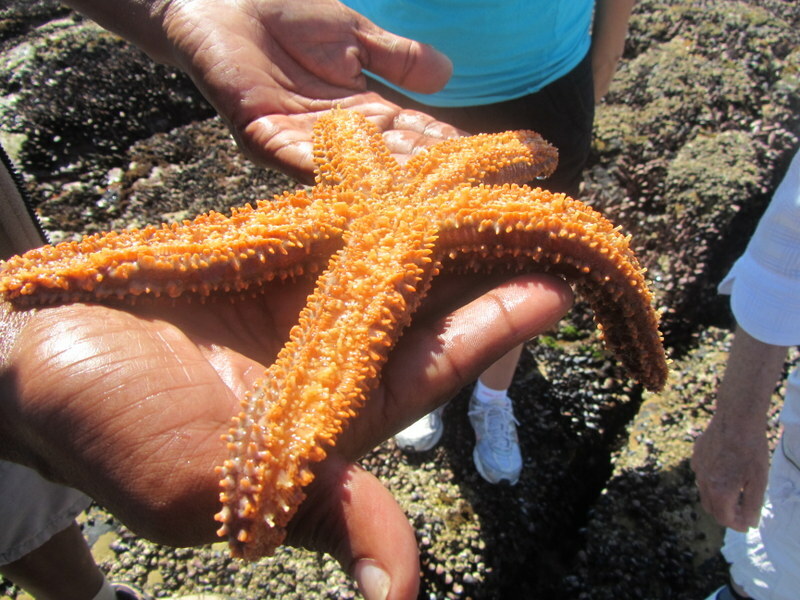 Willie led us to the rock pools and within minutes he had located a huge orange starfish to show us. 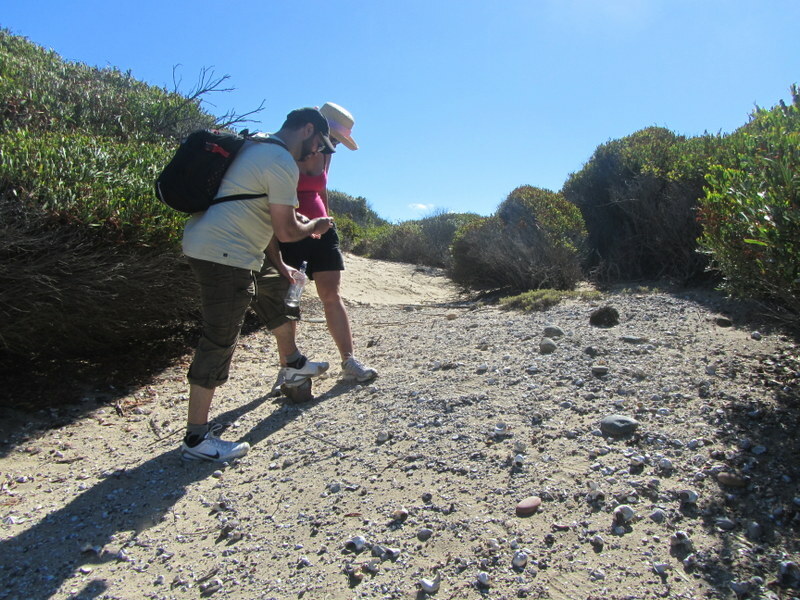 This together with the crabs, alicricals, sea urchins, etc …… that he found along the way, was start of a fascinating introduction to the rocky shores we would be walking along. 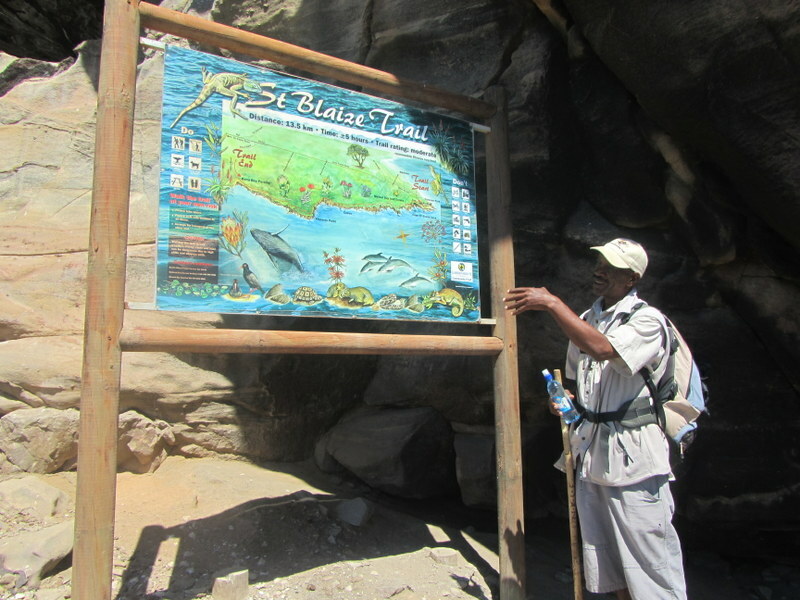 This section is known as the St. Blaize Trail and is a popular day walk of about 15 km along the coast. Most of it is stunningly beautiful, but there is also plenty of evidence of the damage we humans are able to inflict on the natural environment. The mangy dassies as Cape St Blaize, are a result of visitors to the area feeding them, because they seem “cute”. 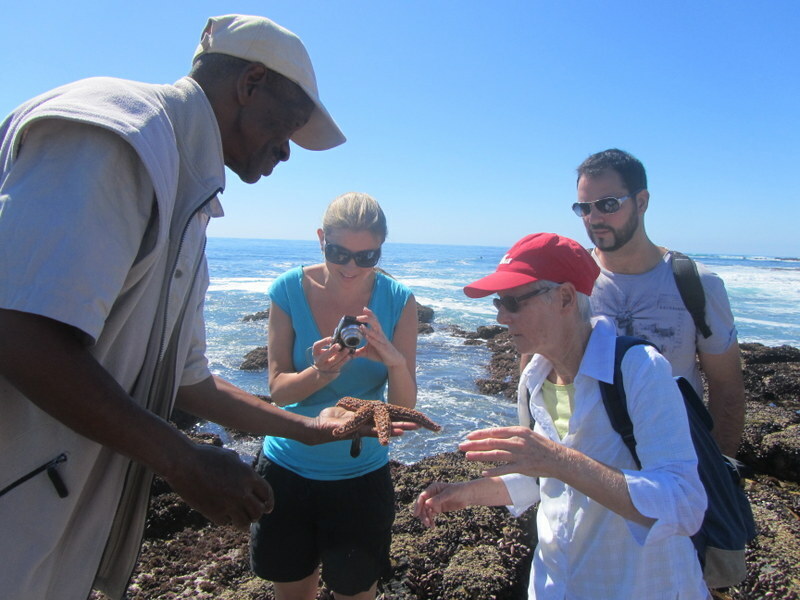 discovery by European explorers or about the interaction between those early sailors and the local inhabitants. fence was guarded by a uniformed security officer, sitting in a lonely wooden guardhouse. Each of us had to sign in at this access point to plush Pinnacle Point Resort and Golf Estate. I had heard about this development and felt a bit of resentment at being forced to sign in to an area that for many years had free access to the public and which by rights should have be public land. Pinnacle Point Golf Club above the historic caves. Nothing could have prepared me for the aberration that followed. The bloated houses, designed to stand out in the environment to satisfy some owner’s or architect’s ego, the greens built to destroy beautiful cliff faces, the paved paths designed for electric golf carts to carry fat golfers so that they could hit golf balls into the rough of the valleys between the t’s and the greens. 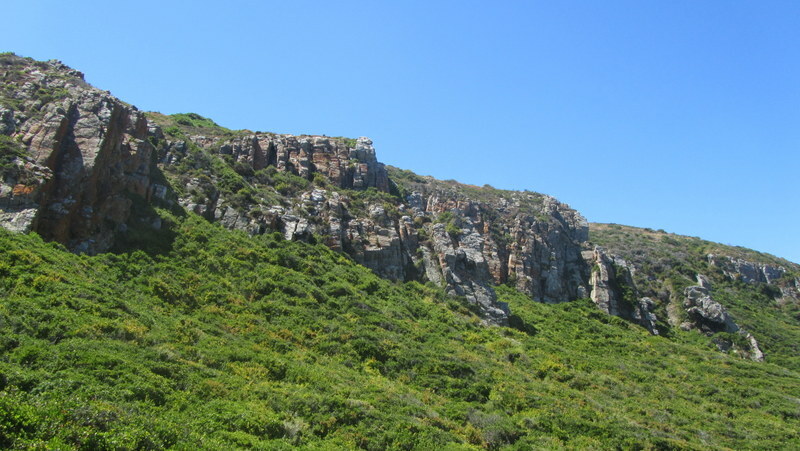 In the cliff faces below are caves and that provide evidence of human habitation dating back thousands of years. The contrast between the natural coastline and the obscene human creation highlights all that is bad in this kind of development and the way in which those developers ride roughshod over any environmental concerns and the rights of others. After walking through the ostentatious club house, it was a relief to get away from the artificial greens and back on to a path through the natural environments finally exit past a security guard on the other side, very close to beach level. 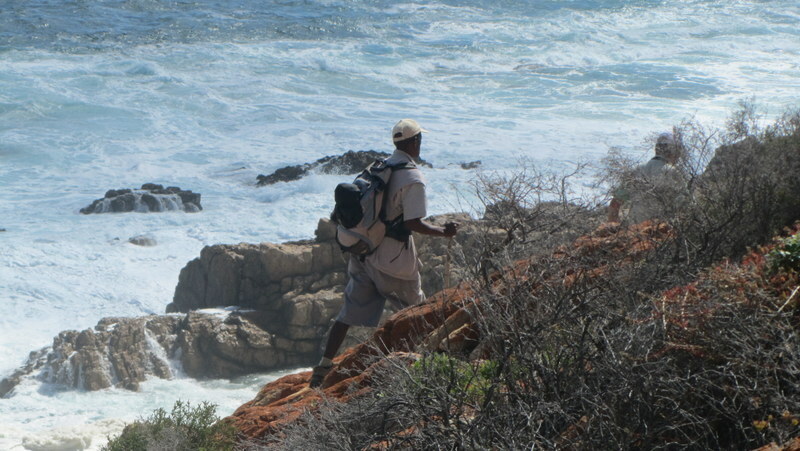 The negative energy dissipated as we walked the orange lichen covered rocks and on to Dana Bay. Ominous clouds were building on the horizon as a predicted cold front moved towards us. 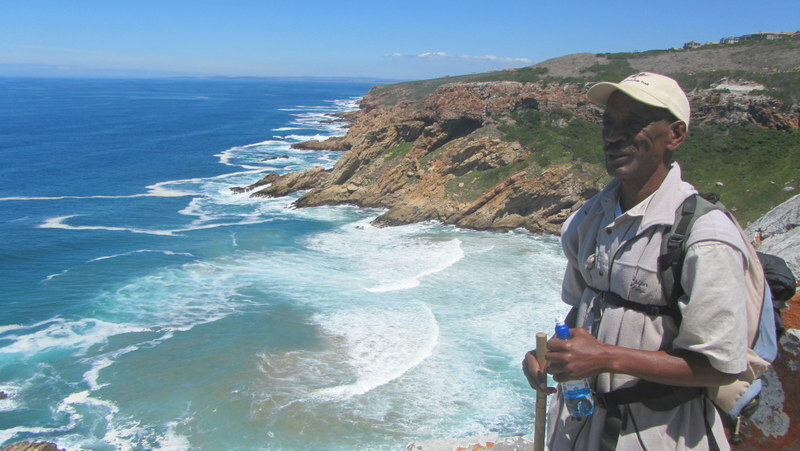 As we approached the small settlement where we would spend the night, Willie arranged for the guest house owners to collect us at the end of the path, for transport us to the overnight venue at Bokmakirie Guest House. Sure enough, Koos was there and with the wind picking up and temperature dropping quickly we were all happy to see the comfort of our overnight venue. Koos and Ria proved to be fantastic hosts, greeting us with a selection of delicious snacks and hot beverages and ginger beer and making us feel welcome. We had a few hours to kill before dinner and I took the opportunity to soak the muscles in a bath before catching a short nap. The evening meal was equally delicious and between us we managed to finish off a few bottles of local Jakalsfontein wine. The cold front that we had hoped to avoid set in and when I woke in the morning the outlook was bleak. 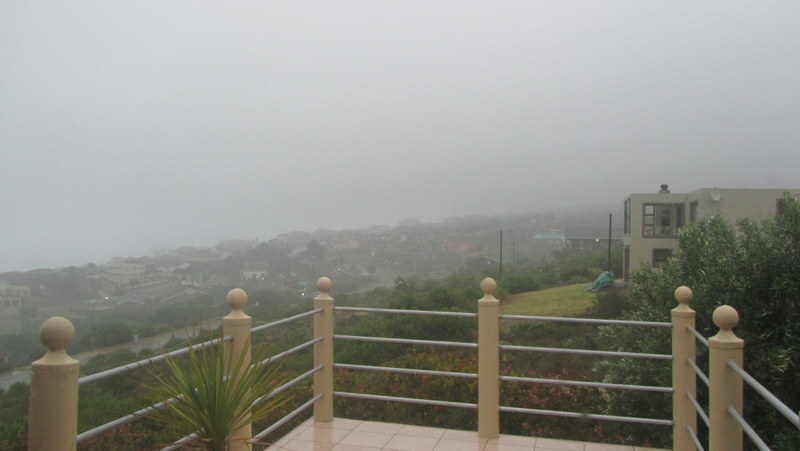 Where there should have been a great view ofDanaBay, there was only mist and light rain. It was an ideal morning to curl up with a book and stay in bed. But we were here to walk and I dragged myself out of bed and down to breakfast, every now and then looking out the window for positive signs the weather would improve. Willie assured us that the walk to Boggamsbaa iwould only take about four hours, so we had time in hand. The rain did seem to be lifiting and after breakfast we made a group decision to wait until 10a.m. before deciding what to do. The alternative would have been to elect to be transported to Boggamsbaai and wait to see if the rain lifted. For me this would have been disappointing. By 10a.m. the rain had lightened to an intermittent light drizzle and was looking positive. After some initial indecision, we all decided to brave the elements. By the time we had packed up and summoned transport to take us to the start, it was about 10.45am. Close to the water’s edge the beach was firm and flat and we were able to set off at a brisk pace. Initially the rain held of but as we progressed it began to drizzle lightly again. them too much we photographed the eggs and left quickly. Further along the beach we came across a leatherback turtle, stranded up on the sand. 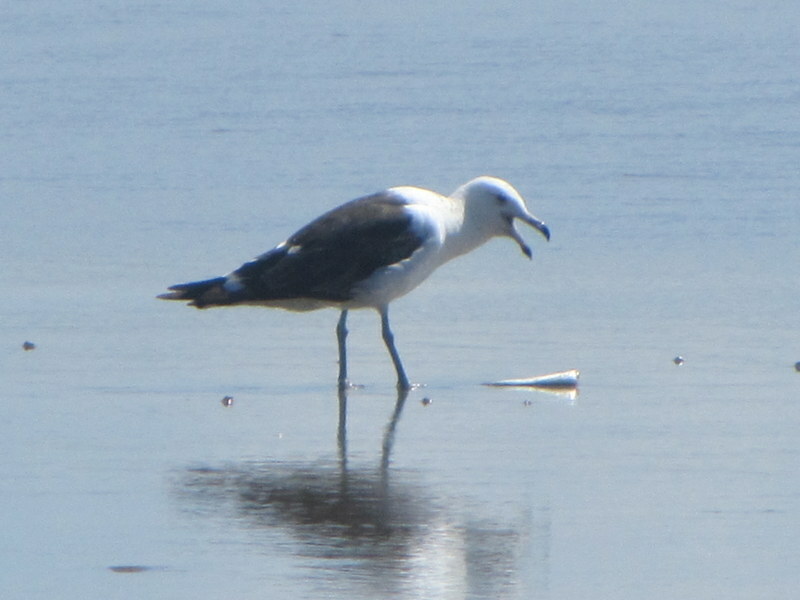 It was obviously injured and Wille lifted it carefully back in to the water. 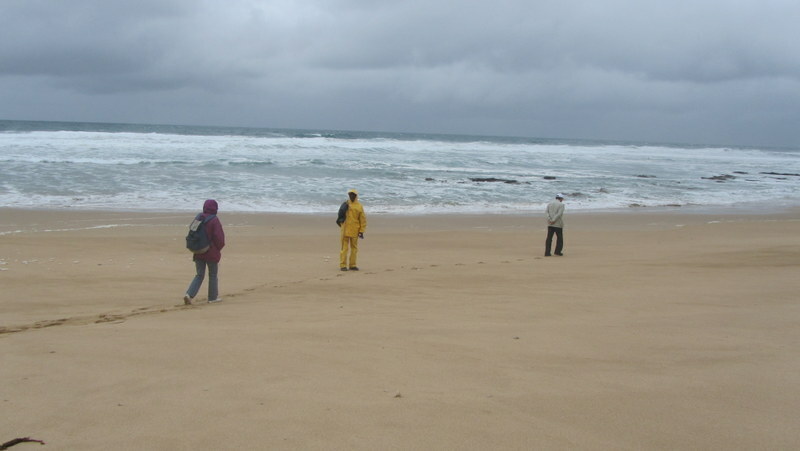 It was too far along the beach to be able to arrange further rescue. It seemed to revive a little in the water and moved off towards deeper water, for nature to take it’s course. Later on in the walk we came across a second stranded turtle. I was convinced that it was dead, but when Willie also lifted this one back to the water it seemed to raise it’s head in gratitude. It seemed to me less likely to survive than the first. By this time the front runners of the group had almost disappeared in to the distant mist and we had to forego a visit to a prominent shell midden at Nautilaus Bay in order that they did not get too far ahead. 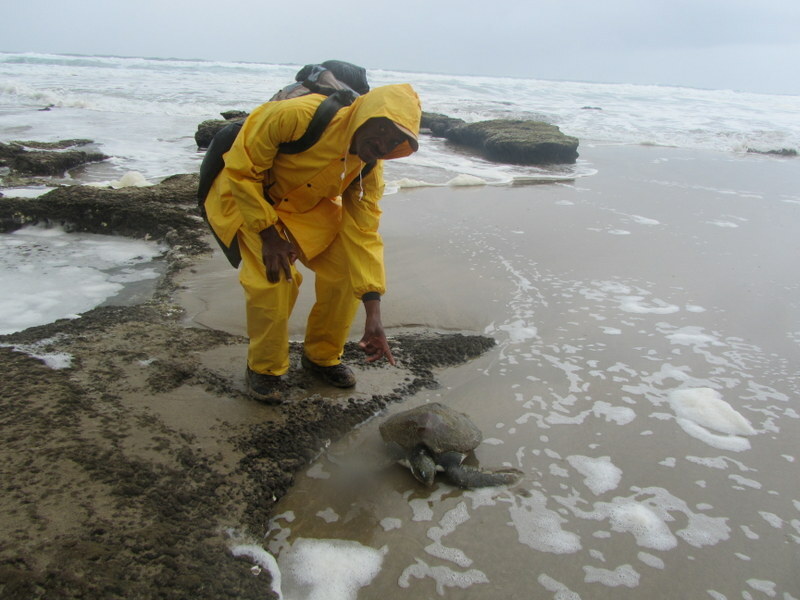 The rain did seem to be lifting, but Willie was concerned that they would overshoot path up to Boggomsbaai. 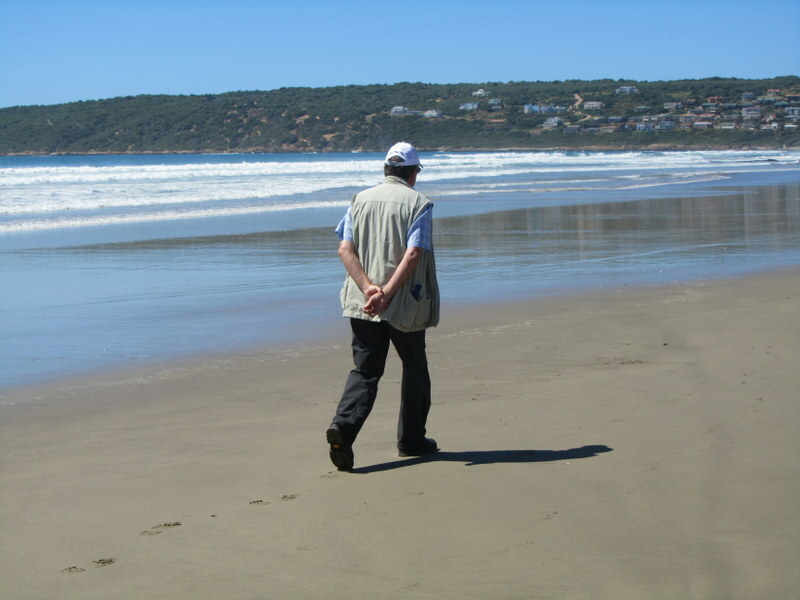 Eventually he decided to catch up with them, leaving me to enjoy a more leisurely pace and enjoy the beach walk. The rain stopped completely now, enabling me to enjoy the beach and allow time for my clothes to dry out before getting to the overnight accommodation. By the time I got in, the rest of the group had found their accommodation and settled in to dry out. Willie showed me to my cottage, where a fire was already burning in the fire place and a nice little bowl of snacks to supplement lunch. It was only just after 2p.m. and there was plenty of time to relax and enjoy the afternoon. 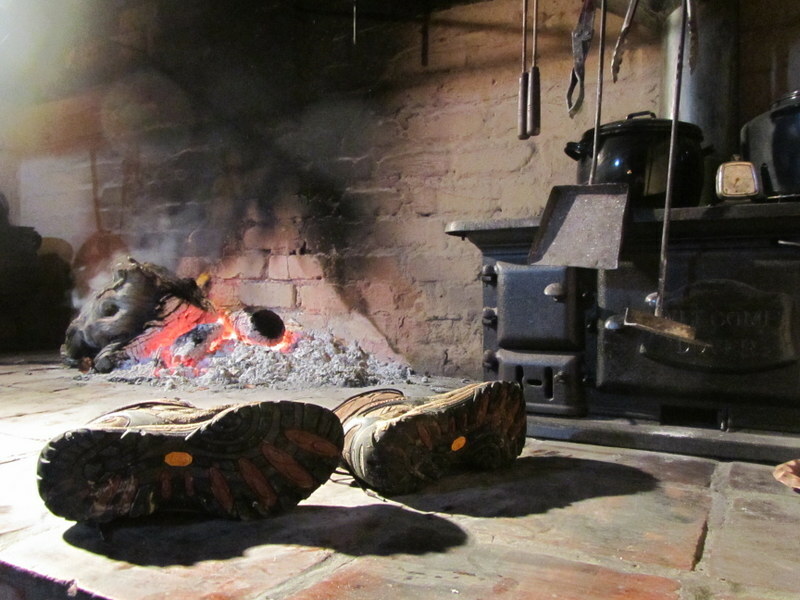 After a leisurely bath to warm up, nice cup of tea and a few more logs on the fire to help the soaked boots dry out, I went out to join Fred for a beer. 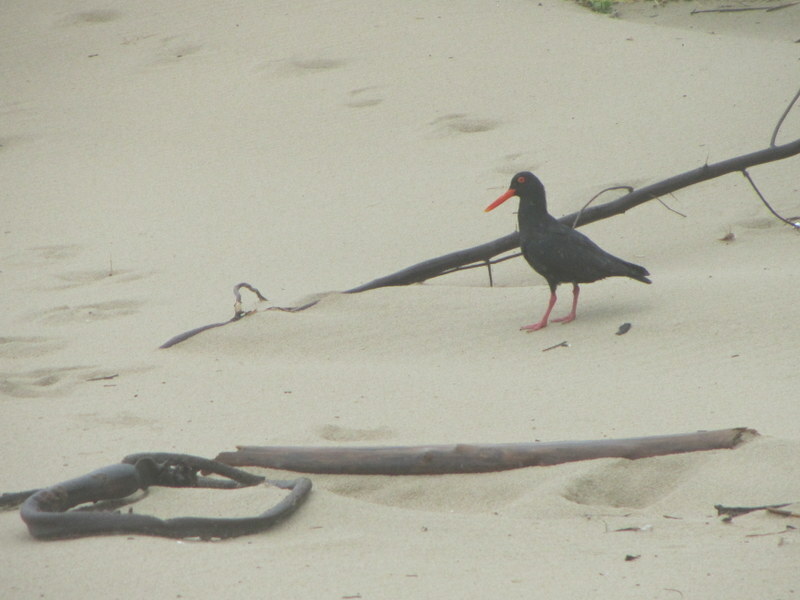 There was still plenty of time before dinner, so I wandered around enjoying the abundant bird life of Boggomsbaai before dinner. 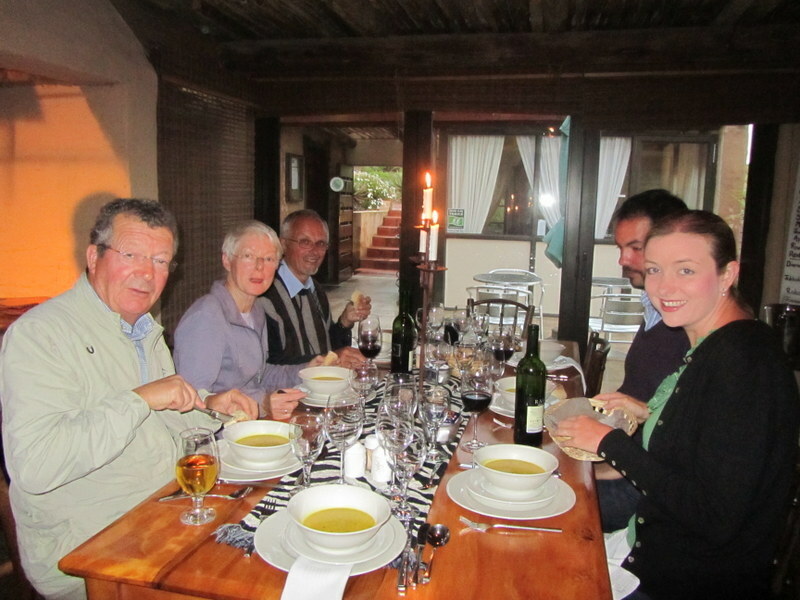 Dinner was a very sociable affair around the table next to the huge fireplace at the Sunbird Centre. Clearly with the size of the logs on the fire Fred was expecting us to dine until the early hours of the morning. Nevertheless, after being entertained by Tim, with his typical Irish gift of the gab and the never ending banter between him and John, we retired at a reasonable hour to prepare ourselves for the longest walk of the trail the next day. 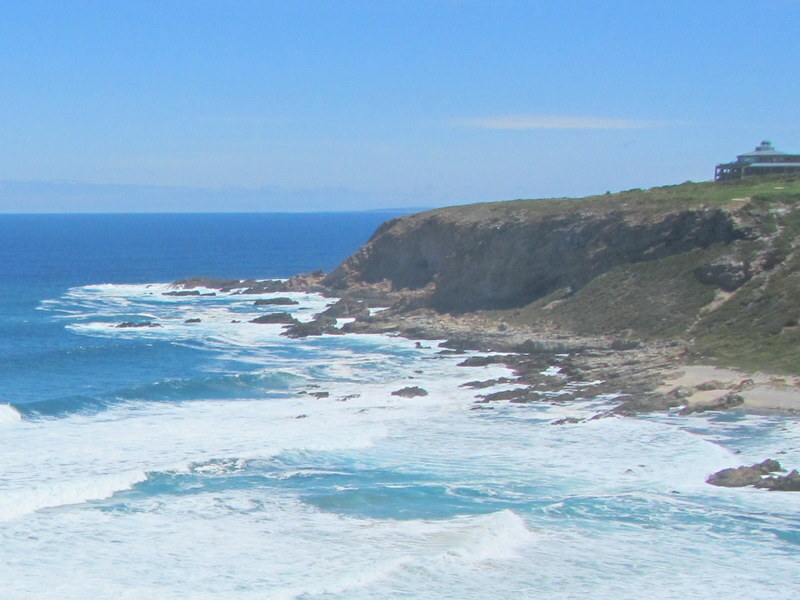 The idea of walking 19km from Boggomsbaai to the Gouritz River Mouth was quite daunting after two fairly easy days. This particularly as the terrain looked quite a bit rougher. After the usual hearty breakfast, we set off through the streets of the sleepy seaside village and headed towards the beach. 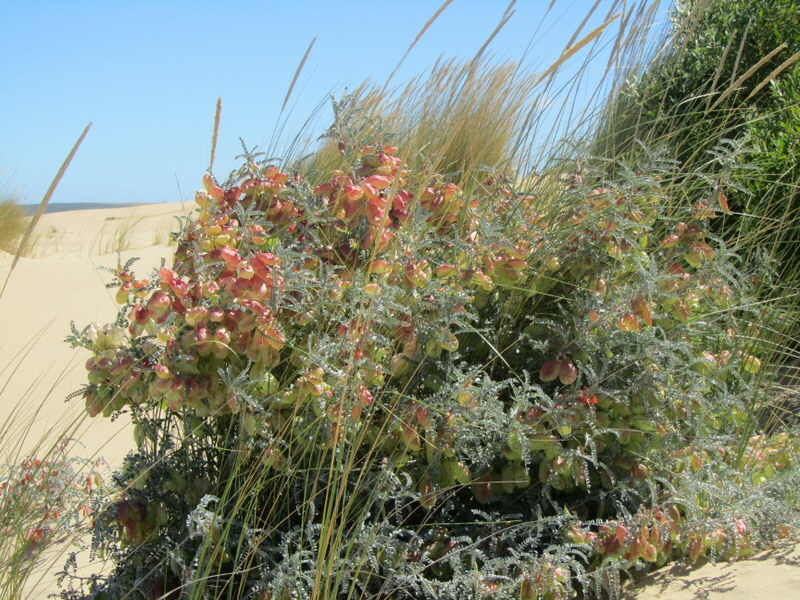 We had hardly left the Sandpiper Centre, when Willie was already finding a few interesting plants to identify and explain the uses – use this one for a tight chest and this one relieves indigestion and don’t touch this one it is poisonous. There is the usual variety of closed up holiday homes, some huge and ostentatious and others small and more typical of a cottage by the sea. There were a few that were occupied for by their retired owners, with beautifully kept gardens and features. After the previous day’s rain the air was crisp and clear and it was good to feel the sun. 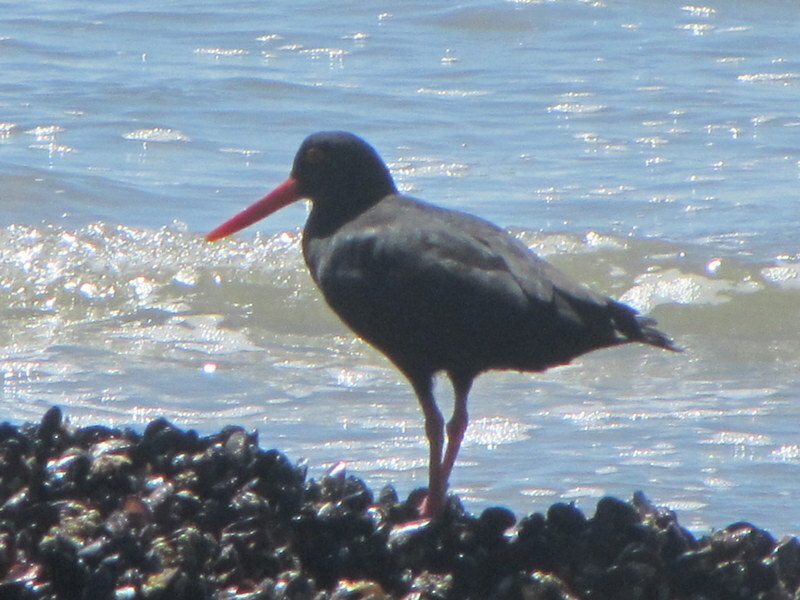 Almost immediately after reaching the beach, the oyster catchers were screeching at us, protecting their territory. 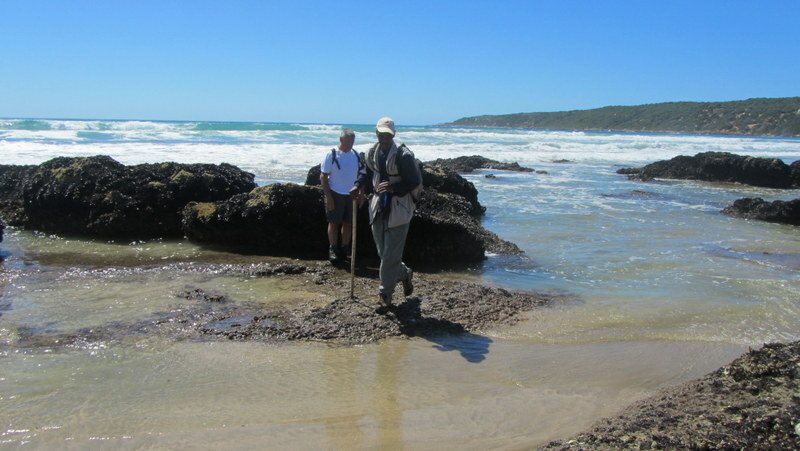 There are more rock pools and features on this stretch and we spent quite a bit of time exploring these, with Willie helping us identify the various forms of sealife. 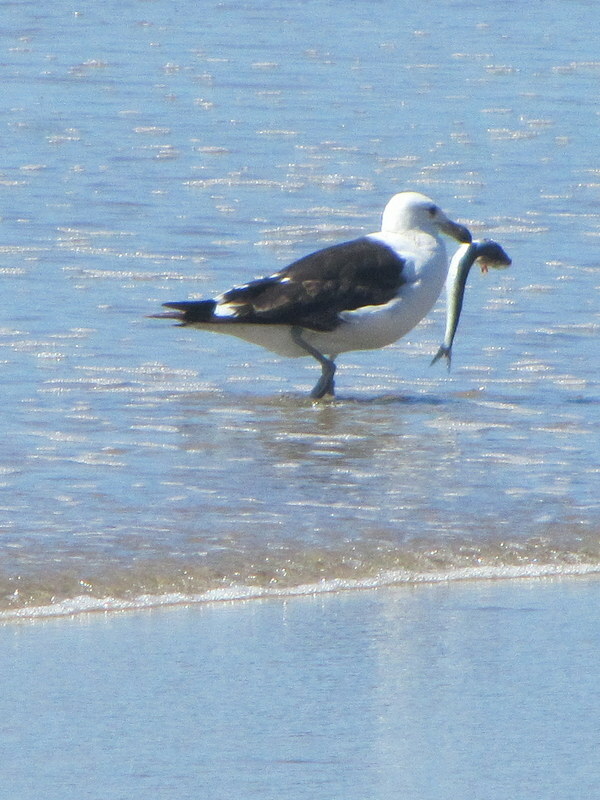 We disturbed a seagull feasting on a pilchard, presumably caught close by, but determined not to let go of his breakfast. 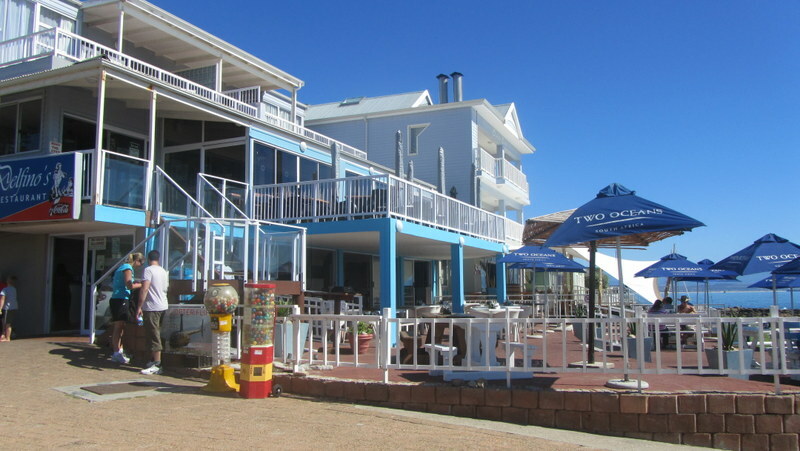 Vleesbaai is not far from Boggomsbaai and we soon came across the famous oyster beds of the area. Concession holders were searching for potentially harvestable oysters, with their long iron bars, probing and feeling, looking for good ones and pulling out ones that had not developed to make room for new growth. John and Tim questioned one of the ladies busy with her harvest until she gave them an oyster each to try. 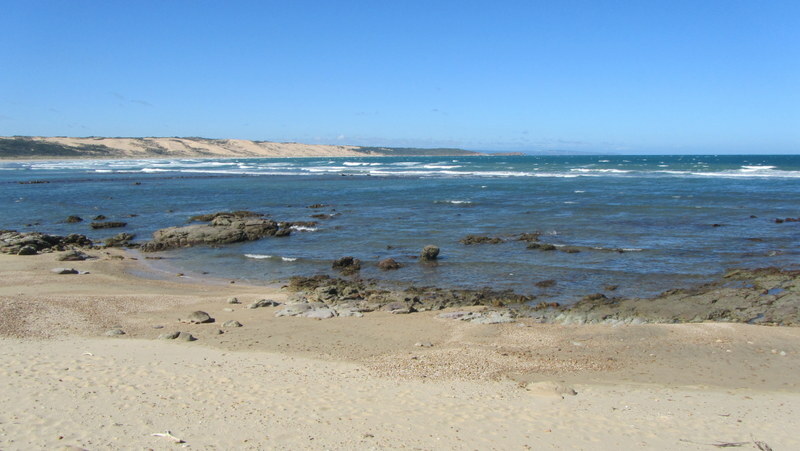 Vleesbaai is reputedly the place where European explorers first came in to contact with the local Khoe people. Bartholomew Diaz, the Portuguese explorer, looking for a sea route toIndiawas blown round theCapein a storm in 1488. Turning West after the storm abated he made landfall here and was able to barter for provisions and water, before his crew mutinied and forced him to return toPortugal, making landfall at theCapeon their way. purely for their scent or insect repellent properties. Also along this path are a few interesting shell middens, clearly indicating human occupation of the area dating back a few thousand years. 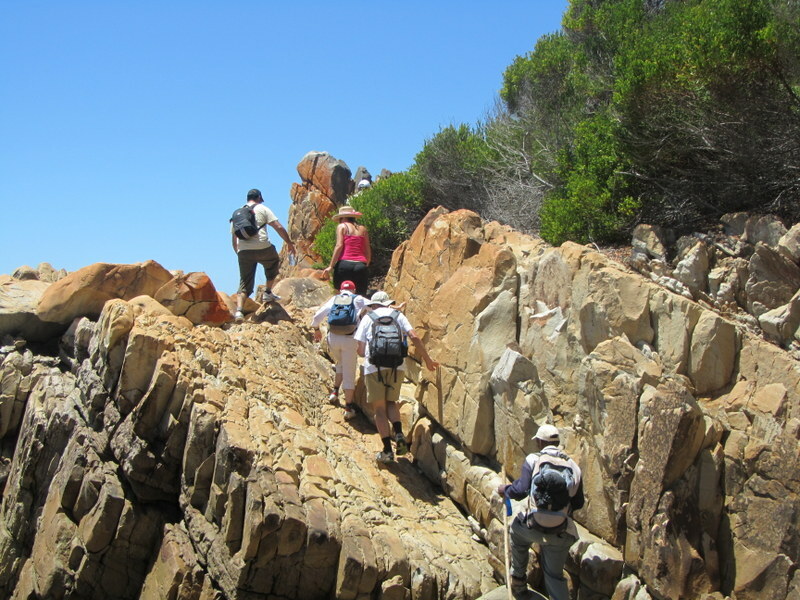 The coastline now becomes a lot more rocky with the trail negotiating uneven terrain, past crevices and rock pools, clambering up short steep terrain and then descending back down, close to where the waves are breaking. 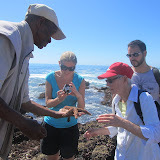 Willie stops from time to time to pick a periwinkle out of a rock pool to show us how the trap door opens and shuts, or to identify an interesting marine growth on the rocks. 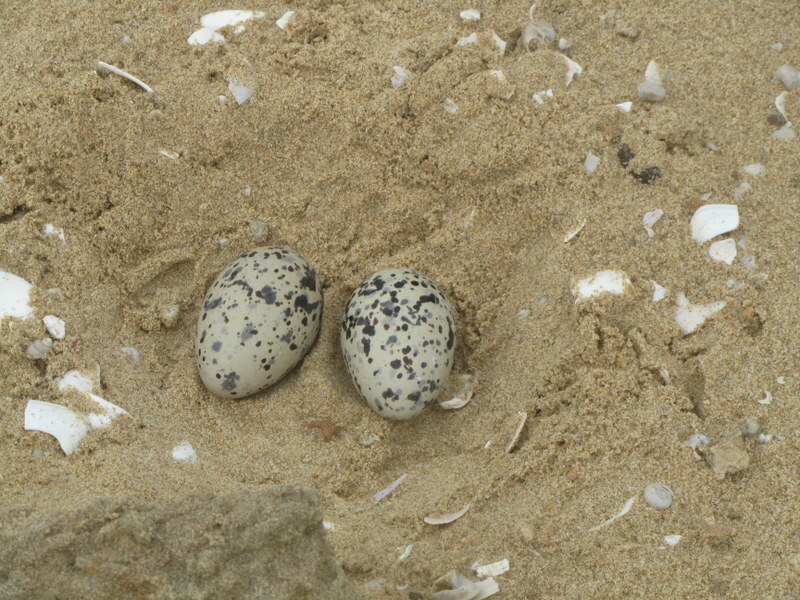 We came across another Oyster Catcher egg lying in the sand, as the angry parents tried to distract us away from the nest. White breasted cormorants watched us from their vantage points on the rocks as we passed by. Occasionally we stopped, just to enjoy the sound of the sea and the might of the breaking waves. 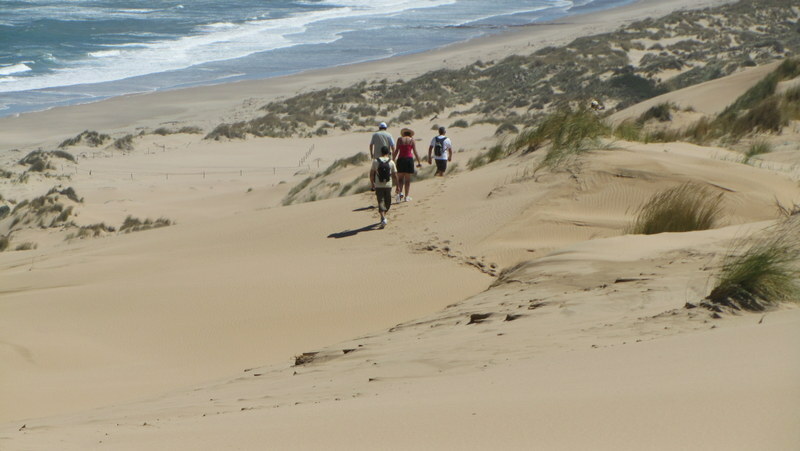 Running a bit short on time, instead of following the path all the way around the coast, we took a short cut on a steep path up the dunes, meeting the road just before Fransmanshoek. We descended on to the rocky peninsula with it’s small, white beach on the eastern side. 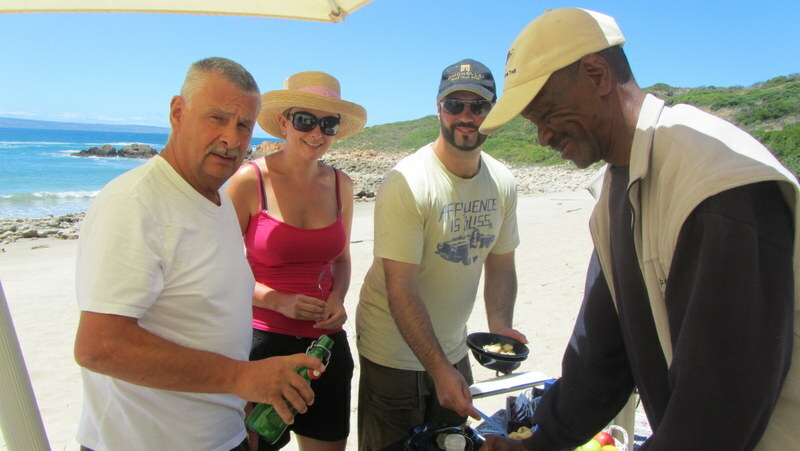 No lunch packs were provided today, because down on the beach a table was set up with cold drinks, salad, a delicious pasta, fresh fruit and even coffee. What a welcome site. Boots and socks came off for a paddle in the sea, before tucking in to the meal. le Fortune, the story of which is featured in the small museum at the view site. After a quick look around we continued our walk. 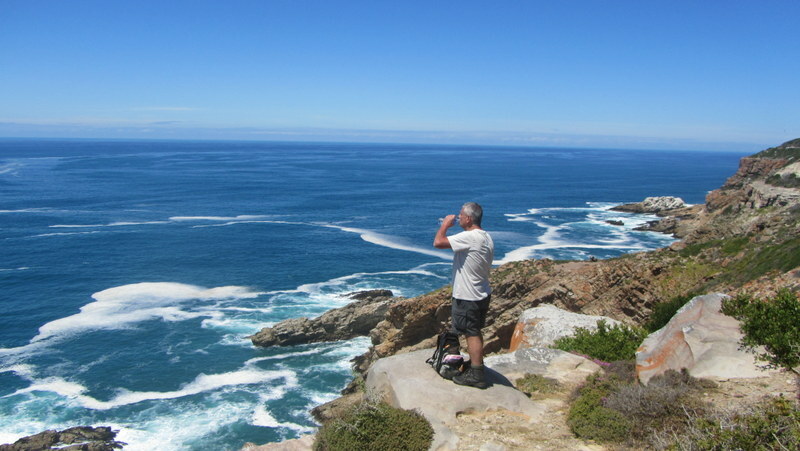 now, they give a stunning view of the coastline the end point of the trail in the distance. Walking along the wind blown ridges, with deep amphitheatres between them, one could have been in the middle of a dessert. Parts are overgrown by alien stands acacias, but there are also an impressive number of the legendary Cancer bush (Sutherlandia). The occasional sound of chain saws in the distance provide evidence of efforts to clear the invasive species. The little settlement of Kanon, the next landmark on the trail, looks quite a way away along the beach as we descend along the ridge of the tallest dune and back down to the beach to head for Kanon. 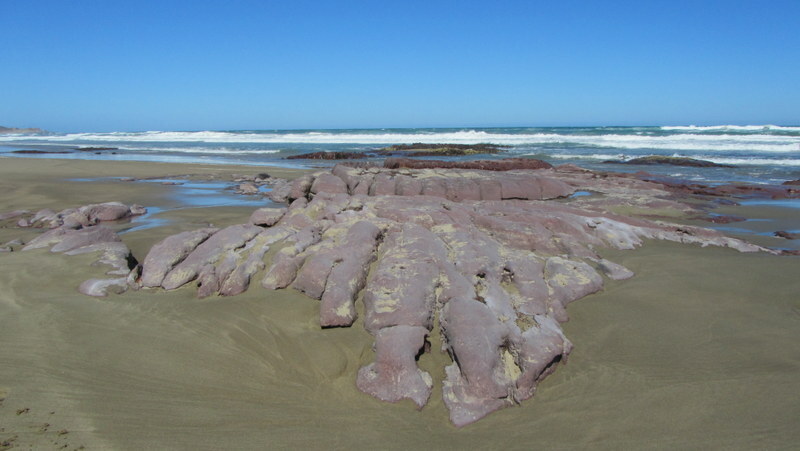 The beach revealed some interesting rock formations, lots of jelly fish and a few colourful pieces of seaweed. 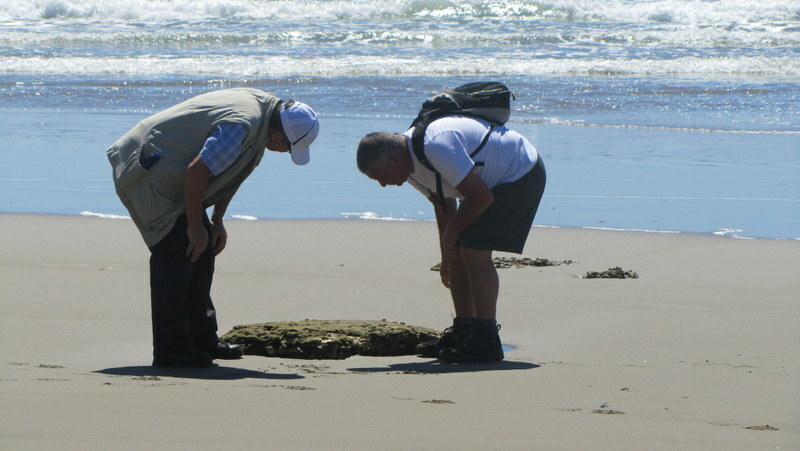 Just before reaching Kanon, Willie showed us a large shell midden set well back from the beach. The number of mussels, limpets, periwinkels and abalone that needed to be eaten to make up these huge piles of shells is quite staggering. Kanon itself is a small resort with a campsite and bungalows. The canon retrieved from the wreck of le Fortune are on display and it is from these that it gets it’s name. Finally on the last leg of the trail, the path comes close to the coast. 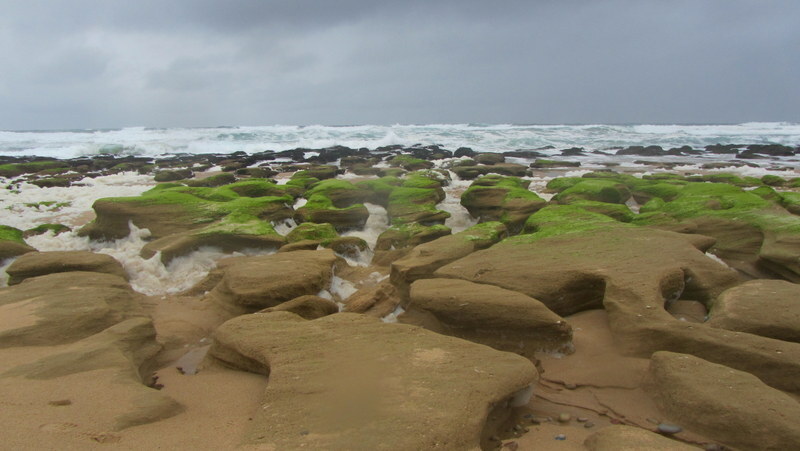 The most significant feature of this stretch, as we head towards theGouritzRivermouth, is the amount of flotsam and debris washed up on to the rocks and gullys. Logs from huge trees, roots, branches and all are piled up along the coast, evidence of the destruction caused by the Laingsberg floods, way back in 1981. What impacted was how long after the event, the results could still be seen so clearly. 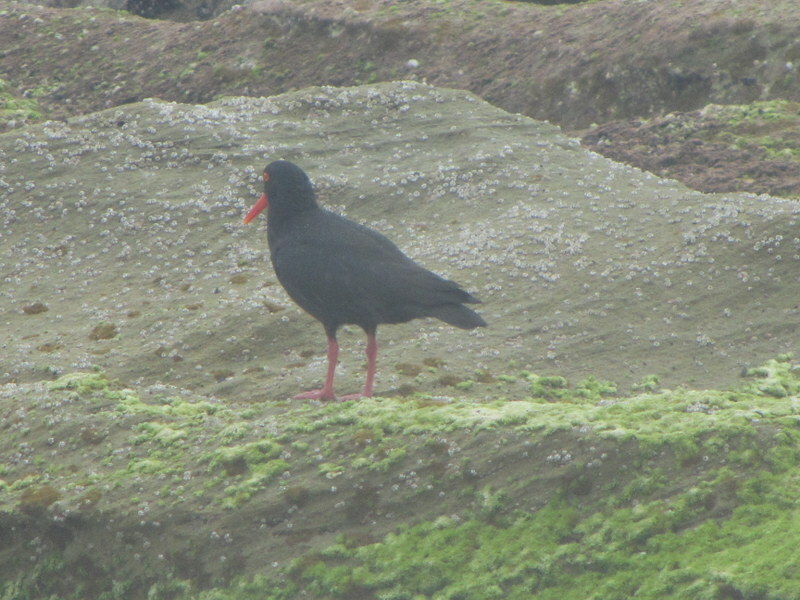 Willie spotted a seagull nest with eggs sitting in a rocky hollow, lined with small branches. The seagulls were disturbed by our presence and became quite aggressive, diving down close to my head as I stopped to photograph them. The river mouth is a good deal wider than I expected and the small town on the other side larger than anticipated. The bird life became more abundant, both giant and pied kingfisher being spotted by various members of the group and a jackal buzzard souring overhead. The site of the motor boat that was to take us to the other side of the river was a welcome one, at the end of a long and interesting day. Transport waited to take us back to Boggomsbaai and a welcome beer. It was a festive dinner that evening, starting withFred Orbanwelcoming us with fresh Vleesbaai oysters and some excellent sparkling wine. Willie presented us all with our certificates and there were special awards for Tim & Camilla. 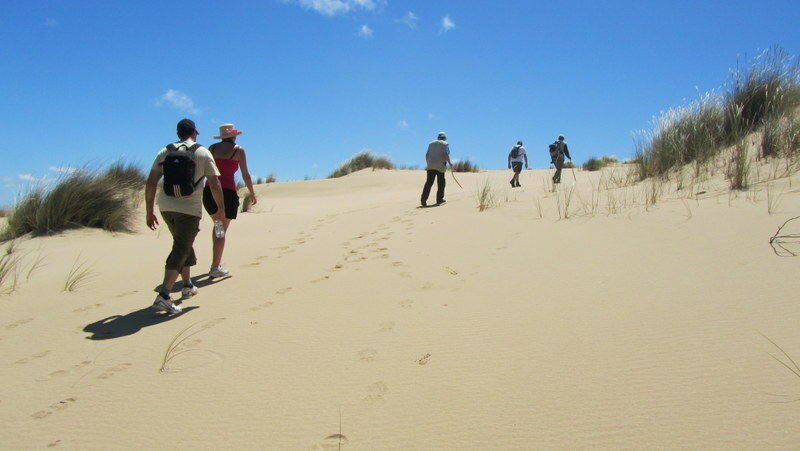 The trail will not only be remembered for it’s great scenery and fantastic trekking, but for the good company, good humour, laughter and friendship. perhaps to experience the slightly less luxury ‘Green’ version of the trail, where all the same facilities are provided, but with hikers doing their own catering.